Paula's Dollyland: Village updates and lovely purchases! Not been on for a little while as my good friend Karen has been here for a few days. Shes very good at sitting with me discussing future plans for Quayside lol we even made her do the big Quayside quiz Bethany did for my niece and nephew and she only missed one point so she had been listening lol! Well the good news is I sold a couple of my houses so I have enough funds to pay for the new cottage which is brilliant and Julie has almost finished it. I can't wait to see it I only have a vague idea in my mind what it looks like so I am excited to see the finished article! I have had a bit of a spend lately I have done well on Ebay so its nice to have some unexpected extra funds for a few treats. Fist I will show you my beautiful sampler that finally arrived today from America. I was a little worried it had got lost as it was posted a while ago but it had just gone the scenic route via Miami lol!! I had seen it a few times in Caroline's wonderful Etsy shop but after I decorated my new Dollyland I decided it went perfectly with the decor so I had to buy uit!! She very kindly changed the American flag to a Union Jack for me. I have put it in a frame above my desk so I can look at it everyday as its just wonderful! Next up is a little beach hut draught excluder I spotted in Lidl when I was out shopping with Karen. I just couldn't resist as it was only £6.99 and was the perfect theme and colours to match my room. It will keep me toasty in the winter which seems to be getting nearer by the minute! I have made a few of my own dolls lately but I always check to see if Bernadette has any new ones I can add to my village. Last week I spotted this clown and I fell in love with him and just had to have him! She very kindly sent me some extra balloons too and he will stand outside the party shop attracting the customers! I have been toying with the idea of having a fish shop as it seems with such and abundance of fishermen the village needed somewhere for them to sell their catches! I saw someone on Ebay selling lots of seafood and thought I might make a little cart or market stall to sit on the harbour to sell fresh fish. They arrived today and there is a really good selection which will be perfect addition to the village. 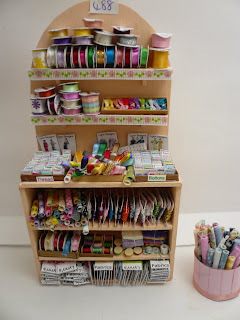 I had decided to make the little purple shop a wool shop and my lovely friend Deb is busy knitting me the most exquisite little things to put in it but browsing Ebay the other night I spotted this gorgeous sewing centre and fell in love with it!! I bid just at the last minute and quite honestly didn't think I had a hope of winning it I expected to fly past my maximum bid but was thrilled when I did win!! I can't wait for it to arrive its just fab!! So I may end up having to move to larger premises and be a wool and sewing shop or be 2 separate little shops I am not sure yet. Lastly an not quite so exciting I found a little shop in my local town that was selling of all their craft supplies. I had never even noticed it before so popped in for a little look. They actually quite a few bits of use. Some lovely adhesive ribbon for 50p, the little easel and canvas were £1.99 and the fimo, beads and clay flowers were all 99p each so I am glad I had a look! A few changes to report in Dollyland. Made Bob and Rose their new garden as the old one didn't fit! I actually managed to fit everything in apart from Bobs shed so that was ok. The green isn't quite right as I wasn't sure on the colour but Julie kindly told me the one I need to get! I'm glad I moved it onto the end as you can now see into the little scullery on the side! Next up I decided to make the little pink shop Sea Thrift cottage into the flower shop. I made a new stand for outside and put some stock inside. Its a little empty at the mo and the counter will change but for now Eve is so busy she hasn't had time to phone the suppliers!!! Last but not least I found this fab little zen fishing kit in a charity shop again when I was out shopping with my friend Karen! It was only £1.50 which was a total bargain as I have been on the lookout for a good fishing rod for ages! The oars are now on Bobs boat and the little boat itself will make a great shelf unit! It even came with ready caught fish! Harry has taken no time to get it into good use in the harbour! Well sorry for such a long post lol I think I don't have much to tell you and then once I get going I seem to think of more and more to say ha ha!!! It all looks fab. I haven't had any time for mini-ing lately as concentrating on getting my new business up and running. I like yor new project. All looking good! Love the new things you've bought as well. Can't wait to see the new house as well, all exciting things happening in Quayside!